One of the characteristics of email marketing is that results are precisely measurable. We will review the most important metrics of email marketing used by SalesAutopilot. You can reach detailed delivery results from the delivery schedule review page, by clicking the "Results" button. At the top of the screen you can find the details of the delivery schedule. Right below there is a period selector. 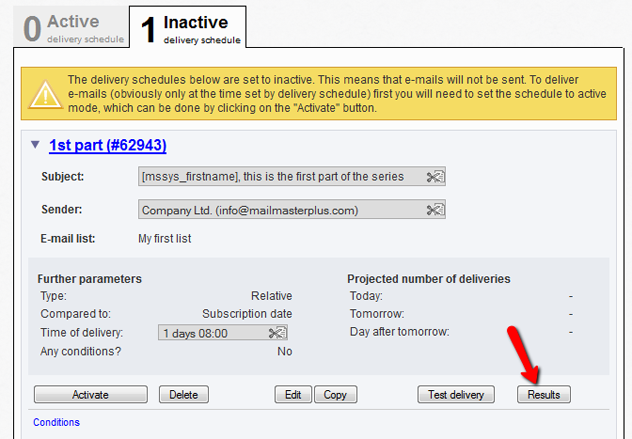 By default it lists the whole period from the creation of the delivery schedule to the current date. Click on the period to change it. It works similarly to the one in the subscribers list. You can also filter the results by the predefined segments. Click the "Filter results by segments" checkbox and all segments of the list will be displayed. Select the segment by which you want to filter the results and click the "Show results" button. If you want to list all results without filtering by segments simply uncheck the "Filter results by segments" checkbox. Below that you can see the "Sent email by day" graph that represents how many subscribers received the email and on which day, how many opened it, and how many click-throughs happened. 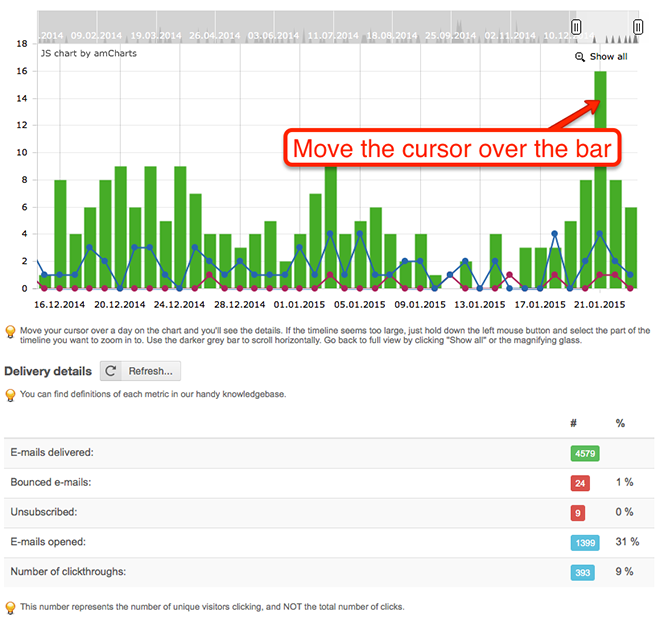 Move the mouse cursor over any of the green bars and it displays the number of sent emails, opened emails, and click-throughs. If you see a relative type delivery schedule the graph represents how many emails were sent on which day and how the open-rate and click through rate changes over time. In the "Delivery details" section you can see the summary of the main metrics of the delivery schedule. Emails delivered: number of sent emails with the given delivery schedule. This number includes bounced emails. If you click on the number you can see the list of subscribers to whom the letter was sent. Bounced emails: number of bounced emails. The reason of bounce can be permanent or temporary. Click on the number of bounced emails to list the bounce reason by subscriber. Unsubscribed: this number shows how many subscribers clicked the "unsubscribe" link in the email sent by this delivery schedule. Emails opened: number of subscribers who opened the email. To measure open-rate is only possible in HTML (multipart) emails. Important: due to technical specialties it's possible to measure emails open only if the recipient's email client allows downloading images. Since not every recipient does this the open-rate is not an precise number. Number of clickthroughs: number of subscribers who clicked at least one of any of the links in the email. This number represents the number of subscribers (persons) who clicked NOT how many times they've clicked. You can click any of the number in the results and it displays the list of related subscribers. For example, if you click on the number next to "unsubscribed" it displays the list of subscribers who unsubscribed from this email. Similarly if you click the number of bounced emails you can list subscribers from whom the email bounced back sorted by bounce types (soft, hard, spam). If you set click-through monitoring during the email setup you can see the click-through results. If you have a profile update form or a landing page link in the email it will be monitored even if you haven't turned on click-through monitoring. SalesAutopilot is able to track click-through by each link separately. In the "Clickthrough details" section of the results all of the links of the email are listed and also the number of click-throughs by each link. The number represents the number of click-throughs not the number of subscribers who clicked. This also means that the summary of the numbers are usually higher than the click-throughs at "Delivery details". 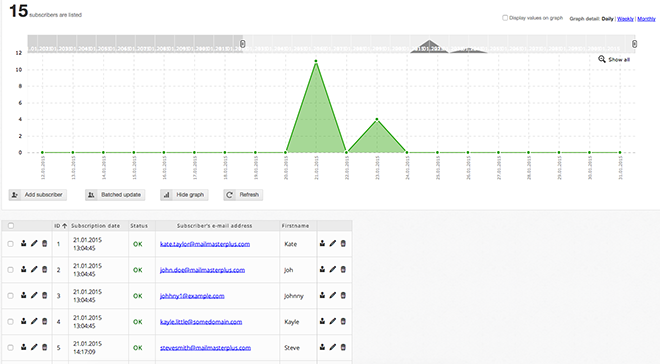 The detailed click-through report shows the click-throughs by email versions. At the end of the list there is the summarized click-through report of all versions. When you edit an email a new version is created, but the older version is also stored. Due to this method when you remove a link from the email its results won't disappear. 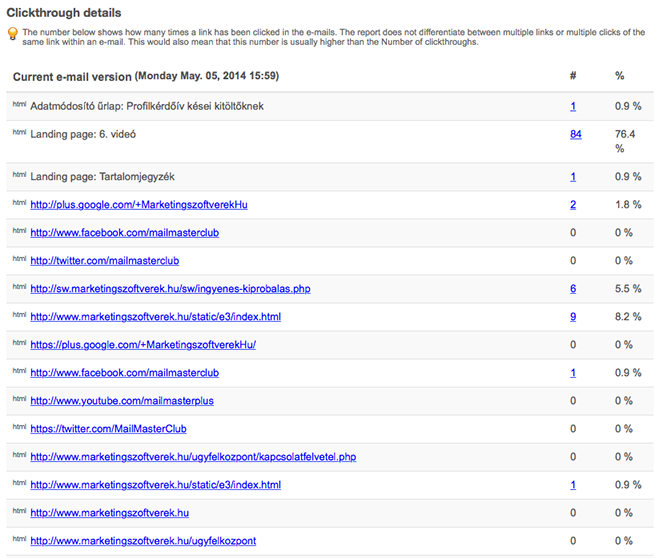 So at this summarized click-through report you can see all links of all email versions.